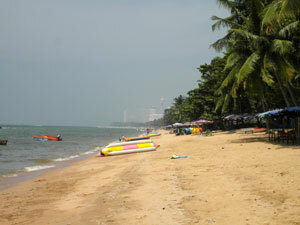 Great beach in Jomtien. 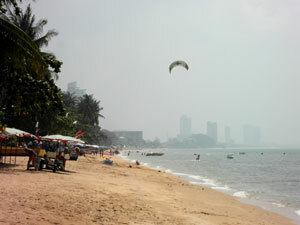 Jomtien Paradise Condominium is located at the south end of Jomtien beach road. Wonderful location if you come as a family or someone who likes it quiet yet still want to be able to go to Pattaya on a 25 minute baht bus drive. 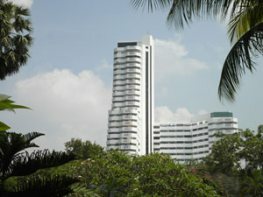 Paradise Condominium is right at the intersection of Jomtien Beach Road and Chayapreuk Road just a short walk to Jomtien beach. Enjoy the beach and the ocean by kicking back on one of the beach chairs under a sun shade. Drinks and food can be purchased from beach vendors. 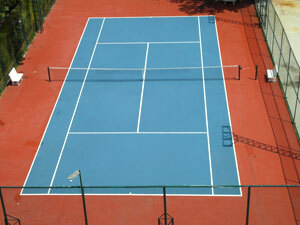 At Jomtien Paradise Condominium you also have a tennis court and a nicely equipped gym. Spectacular Sea Views from some of the Condominiums at Paradise Condominium. 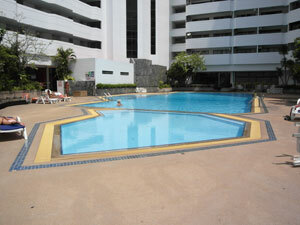 Click here for a Jomtien Map and the location of Paradise Condominium Complex. Opens in a new window. 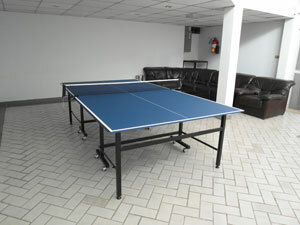 2 large swimming pool, new fitness center, 1 tennis court, sauna and steamroom, mini mart, laundry service, restaurant and bar, 24 hour security. Features: European kitchen with oven which is fully fitted out, 3 bedrooms, air cons, ceiling fans, flat screen TV and DVD, fully furnished, large terrace with pool view. 192 sq m.
Sales Price: 9.25 million Baht. Short and long term rental available from 45,000 - 75,000 Baht a month depending on season and length of stay. 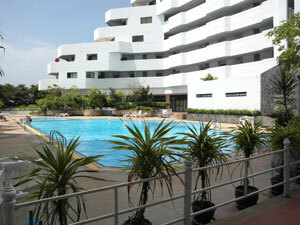 Features: Kitchen fully fitted out, air con, ceiling fan, LCD and DVD, fully furnished, sea view from the balcony. 40 SqM. Sales Price: 1.95 million Baht. Short and long term rental available from 16,000 - 24,000 Baht a month depending on season and length of stay. Features: European kitchen fully fitted out, air cons, ceiling fans, satellite, high speed internet, Large LCD TV & DVD, fully furnished with hand made teak furniture. 200m2 Sea View Terrace. Sales Price: 9.3 million Baht. Short and long term rental available from 50,000 - 80,000 Baht a month depending on season and length of stay. Features: Features: kitchen fully fitted out, air con, ceiling fan, feature ceiling with dimmer lighting, TV and DVD, fully furnished. 40 SqM. Sales Price: 2.1 million Baht. Short and long term rental available from 14,000 - 21,000 Baht a month depending on season and length of stay. Features: Kitchen with oven which is fully fitted out, air con, ceiling fan, LCD and DVD, fully furnished, balcony with great sea view. 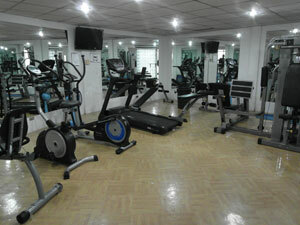 40 sq m.
Sales Price: 2.45 million Baht.